Union General William T. Sherman's March to the Sea was a defining chapter in the American Civil War; Sherman became remembered in the South as a brutal proponent of total war. Union General William T. Sherman was a friend and trusted subordinate of General Ulysses S. Grant, commander of all Union armies in the field during the Civil War. Sherman supported Grant during difficult times and assisted him capably during the pivotal Battle of Shiloh in the spring of 1862. Subsequently, Sherman was placed in command of the Union Army of the Tennessee, and in 1863 he participated in the campaigns to secure the stronghold of Vicksburg, Mississippi, and the important city of Chattanooga in southeast Tennessee, where nine rail lines converged. Sherman was elevated to command of Union armies in the Western Theater of the Civil War in 1864. That spring, he used Chattanooga as a staging area to launch the Atlanta campaign. 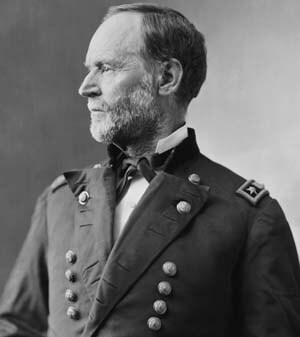 Following an arduous trek of more than 100 miles against the resourceful resistance of Confederate General Joseph E. Johnston, Sherman succeeded in capturing Atlanta. He then turned his army southwestward and vowed to “make Georgia howl” as his troops lived off the land, destroyed rail lines, and wreaked havoc across the Georgia countryside during its “March to the Sea.” Union troops captured the port city of Savannah, Georgia, on December 21, 1864, and Sherman cabled President Abraham Lincoln that he wished to present him the city of Savannah as a Christmas present. To the end of the war, Sherman dogged Johnston’s ragged Confederate army into the Carolinas, burning and ravaging the heart of the Confederacy. Controversy persists to this day as to whether Sherman ordered the city of Columbia, South Carolina, the state capital, to be burned or whether fires were set by retreating Rebels. On April 26, 1865, Sherman accepted the surrender of Johnston’s army near Durham, North Carolina. Sherman was born in Lancaster, Ohio, on February 8, 1820, and graduated from the U.S. Military Academy at West Point in 1840. Sherman served in the Second Seminole War, and during the Mexican War he held administrative posts in the California territory. He also served as the first superintendent of Louisiana State Seminary of Learning & Military Academy, later to become Louisiana State University. Sherman was plagued by bouts of depression, which resulted in his being relieved of significant responsibility early in the Civil War. However, he assisted Grant during operations along the Cumberland River and gained Grant’s confidence during his performance at Shiloh, where he was wounded twice. Sherman is remembered, particularly in the South, as a brutal proponent of total war. However, he, perhaps more than any other commander, understood that victory would only be achieved when the South’s capacity to wage war was sufficiently crippled. After the war, he served as commanding general of the United States Army and remained in contact with veterans organizations. He died in New York City at the age of 71 on February 14, 1891. Tags Abraham Lincoln, American, american civil war, Army of the Tennessee, Atlanta Campaign, Battle of Shiloh, Chattanooga, civil war, Confederacy, Confederate, Confederate Army, confederate general, during the civil war, general, general joseph e johnston, Louisiana, March to the Sea, military, New York, OSS, Savannah, Second Seminole War, Seminole, Shiloh, South Carolina, Tern, the american civil war, the civil war, the union army, Tory, total war, Troy, Union, Union Army, United States, United States Army, us military, Vicksburg, West Point military academy, Western Theater, William T. Sherman, WIN, wounded.